19/100 ‪#‎100sareepact‬ The idols of Gauri are brought usually two days after the beginning of Ganesh Chaturthi. It is placed for three days-first day is the avahana, next day it is Satyanarayan puja, mahaprasad and on the third day is visarjan . Two idols of Goddess Gauri are brought home and worshipped and the arrival is regarded as the coming of the sisters of Ganesha by some communities. Some people believe that it is Goddess Parvati , mother of Ganesha .. Legend has it that Mahalaxmi arrives with her family to her Maheri or Maika for three days in a year. The traditional and ancestral three-day Gauri puja has now become bigger with families giving the homely touch to the festivities, which bring many families together for the celebrations,who are taking the festivity from generations to generations. Since morning reading so much about ikat. 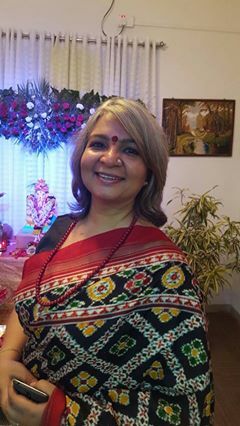 From Bali Indonesia to Patan gujrat ,by Ally Matthan & Aditi de so what other saree it could be for Ganpati Bappa darshan at Rupal & Vishwas Nangrepatil residence & Gori pujan haldi Kumkum at Minal Deshpande Gowri Kanade Deshpande house. These are the joy’s of living in small town where we are part of every festivities in each others houses. Feel blessed to be among such lovely people. Sunday evening was blissful enjoyed the hospitality of our wonderful host Rupali Nangrepatil. 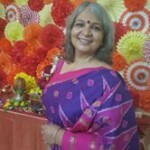 Bought this saree in 1985 from Handloom saree house Delhi. Haven’t draped it more then thrice but I love the feel of this old silk which has absorbed so many happy times, good memories, sad moments, rough faces of our lives hanging in the cupboard. And yes a big thank you to my girl friends who all wore sarees and said they are doing it for us saree pacters. Love you all.